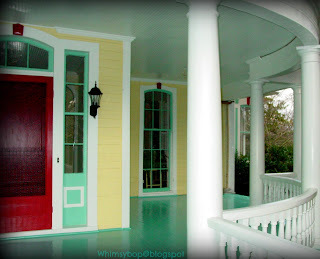 Whimsybop: Beware: Color is contagious! 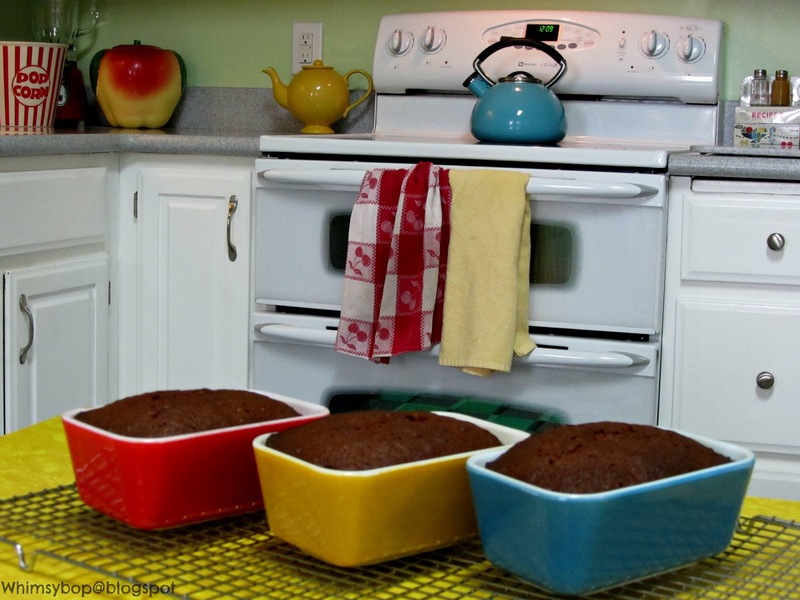 I baked banana bread this morning and had to fetch the step stool to reach my favorite pyrex loaf pans from the shelf. I got them down, rinsed and dried each one and, as I carefully sat them down on my little yellow table that I use as my kitchen island, it dawned on me how much I love the colors red, yellow and blue (aqua blue in particular). In fact, I realized for the first time that I love these colors so much that they show up, not just in quirky things I collect, but also ON my house! Take a look! I give you exhibit A: my kitchen. 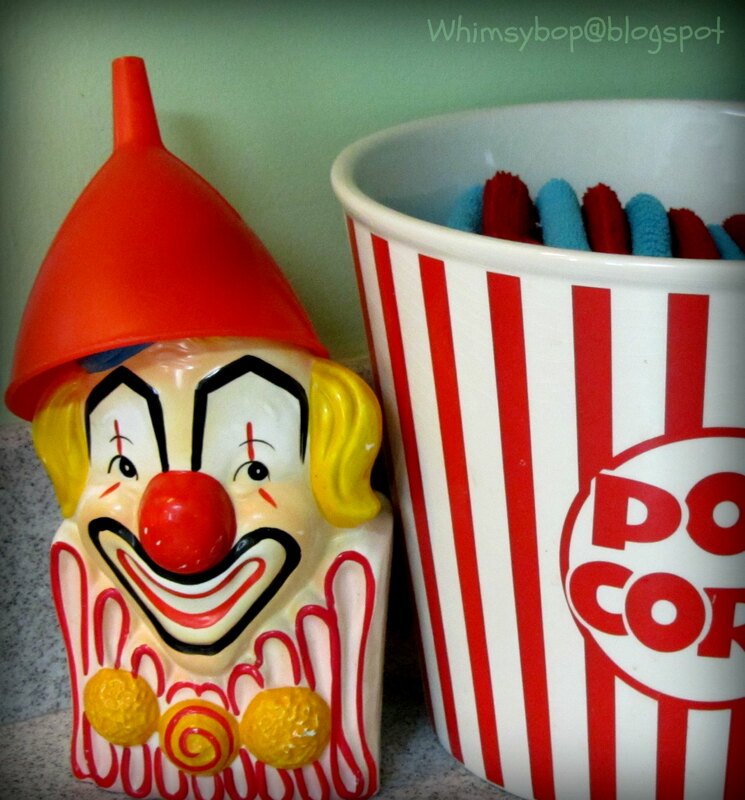 First, let me direct you to the left of the countertop to my red & white striped popcorn bowl, which is where I keep my clean stash of dishcloths. When you look at the rest of the counter, it's not hard at all to figure out which colors I'm drawn to (of course there's much more color in this kitchen to show you, but that will have to wait for another time). 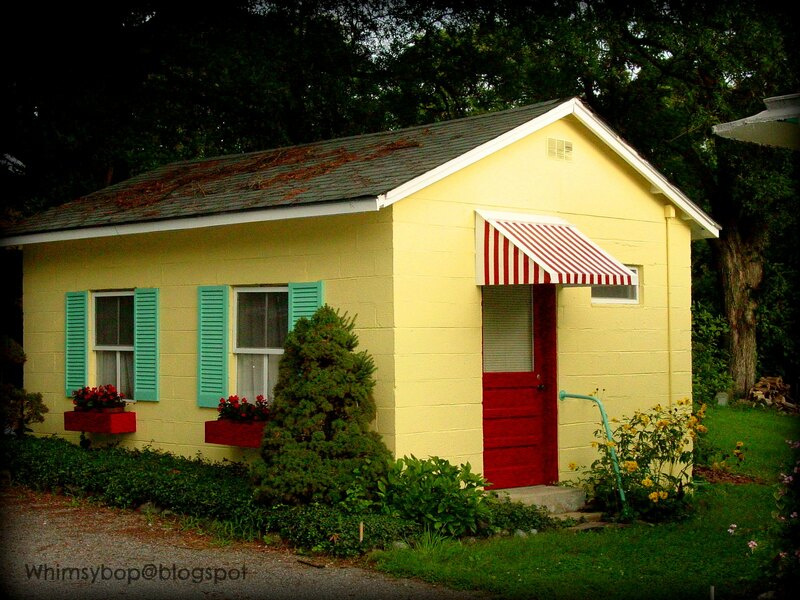 Now I give you exibit B and exhibit C - the colors that I chose for the exterior of our out-buildings and house. Can you believe it? The funniest thing is that I obviously must have a thing for red & white stripes too, because there they are again on the awning of our little guest cottage (crazy huh?). When we moved into our home almost four years ago it was antique white with putty-colored shudders & trim, not ugly, but just not me. Choosing new house colors was a bit of a challenge; at first I thought pink with white trim and shutters, but the men in the family quickly protested - especially the younger one, who blurted out, "Come on Mom, I'm going into middle school, don't do that to me!" He had a point. A circus house? 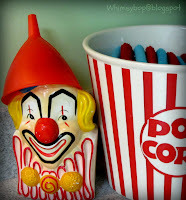 Hmm...well, I guess this would be a good time to show you exhibit D: the clown planter sitting on the other side of the popcorn bowl (he hides my stash of goofy things I save like bread clips, rubber bands, and caps from soda bottles and milk jugs). Why am I drawn to circus colors? Who knows? Maybe it's because they are so colorful and cheerful, or maybe because I was voted "Class Clown" by my high school senior class ...or maybe it's because I live with a bunch of clowns in our big yellow, red and aqua fun house, aka the circus house, aka Home sweet Home. Yep, I bet that's it. Wow, that porch photo is FABULOUS. I seriously love those colors! I love this one so much. You are such a good writer, TJ. I really have to come to see you and your circus house and circus family. I do love the pyrex bread loaf pans, they are really pretty and I love how you realized how these colors were everywhere in, on & around your home. Super post my friend! Beautiful!!!! You have wonderful taste!